Summer's coming to a close, so make time for that one final getaway! Camarines Sur has the perfect mix of exciting and relaxing activities to enjoy with your man or your barkada. You probably know Camarines Sur for its watersports complex (and its wakeboarding hunk, May Cosmo Online Hunk Miguel Villafuerte) and you might think it's only a favorite destination for the extreme-sports-inclined, but there are plenty of other fun things to try in this vacationer's haven. Whether you're rounding up the barkada for a gimmick, or you're spending a relaxing weekend with your man, CamSur won't let you down! Read up on everything you can do in CamSur--from wakeboarding, sunbathing, and swimming to trekking, sight-seeing, and even deer-feeding! 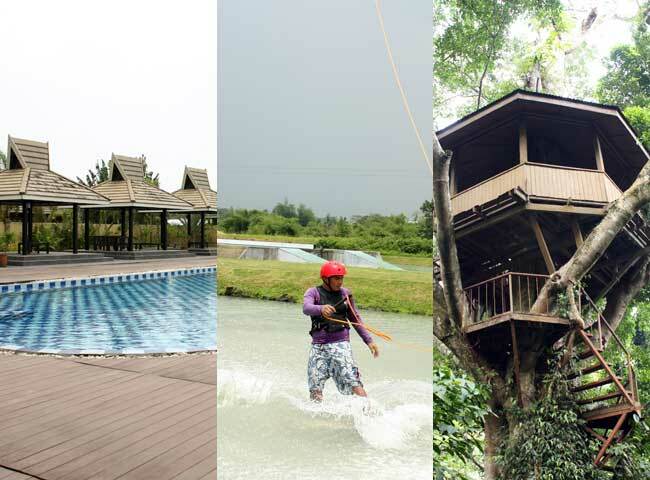 The Camsur Watersports Complex (CWC) is a guaranteed blast! Great weather conditions make wakeboarding and cable skiing always possible, so you can visit any time of the year (so you don't have to feel bad if you really can't visit this weekend). Located within the Provincial Capitol Complex of CamSur, CWC is just a three-minute (1.5km) drive from Naga Airport. If you plan to come via land transportation, buses ply the eight-hour route to and from Manila daily. At CWC you can try a variety of exciting water sports. You'll have easy access to basic equipment and safety instruction by the resident operators. Don't know what to wear for this kind of thing? Gear up for the ride at the park's Pro Shop, which has everything you need to take on a water sport. It has stuff from Republ1c, too, the sports apparel brand owned by Miguel and his brother. While you're having fun, you can keep your stuff safe in a locker (rent one for P25 per day). Depending on how long you're planning to enjoy the cable park, you can pay for a whole day use (8:30AM-5PM) for P610; half-day (8:30AM-12:30PM or 1-5PM) for P370, or by the hour (P125). We've listed the different activities below, you're sure to find something that suits you. If you're a completely fearless chick, try wakeboarding. It's a combination of water skiing, snowboarding, and surfing. (Sounds intimidating? It's actually easy enough to learn in a day.) Instead of using skis, your feet will be bound to a board, and you'll be standing sideways. If that's not enough, try something even more challenging like wakeskating, which is like wakeboarding because it also uses a board, only, you won't be bound to it in any way. Instead, the board's surface is coated with grip tape, to keep you from slipping off (something like a skateboard). Learn the basics of wakeboarding by heading for the Winch Park first, which pulls you much slower than if you were at the cable park. If you're up for a daring ride, which is still a little more secure, try waterskiing. You'll be pulled along by a rope—there's a handle for you to hold onto--attached to a powerboat. You can control your direction and zig back and forth behind the boat. If you're a beginner, you'll be pulled at around 25-35 km/hr. You might also like cable skiing, which is the same thing, only, you're pulled by an overhead cable (suspended 8-12 meters above the water) that rounds the perimeter of the lake. It will have you speeding between 20-65 km/hr. If you were hoping for something a little easier, but equally thrilling, go for kneeboarding, which is much simpler to learn. Sitting on your heels, you'll be cruising on a board as you're pulled by the cable. As in wakeboarding or water skiing, there's a tow-rope to cling to. You'll be circling the entire circumference of the cable park. We also suggest you try their new Pasta Bar, where you can choose your own pasta, sauce, and toppings. Later at night, get ready to party at Happy Ending Bar, CWC's super cool, super hip nightspot, where you can sip on signature cocktails, your favorite mocktails, and local beers with your man or your barkada. After all the fun, if your muscles are a bit sore, why not get a full body massage (P300). You can easily make reservations at the CWC registration counter. And, not to worry, throughout your visit, you can still remain connected to the necessities of the world because the park is equipped with Wi-Fi! Eventually, you'll need a place to settle down and get some shut eye after an exciting day. There are accommodations within walking distance. Right beside the CWC pool area is Villa del Rey Hotel. Check out details of the accommodations on the next page. CAMSUR WATERSPORTS COMPLEX is open on Monday from 8AM to 10PM, and Tuesday-Sunday from 8:30AM to 9PM. It is located at the Provincial Capitol Complex, Cadlan Pili, Camarines Sur, Philippines. Villa del Rey Hotel offers different types of rooms to suit your needs. Whether you're in CamSur with the barkada or snuggling up to your honey for some time away and alone, choose from their pretty and reasonably-priced accommodations. If the two of you are in search of something that's quaint but won't bust your budget, the Tiki Huts (P1,100 per night) are a good deal. You get a single air-conditioned room with a queen-sized bed and common bathroom. You can also opt for one of the Cabanas (P1,700), a single room for two, with a queen bed or twin beds. Wood Cabins are another option for couples or groups of friends who want something cozy. Choose from small (P2,750 per night), medium (P3,250), and large (P3,750) cabins. Another option for big groups is Villa del Rey Trailers. The trailer for two costs P1,500 per night, while a trailer for friends or family (good for four) will cost P3,600. You can also rent extra mattresses per person at P500. And, if you want to give yourselves a special treat, be it for a honeymoon or a bachelorette getaway just with your special girls, spend a luxurious night with a king bed in a spacious Villa (P6,250), complete with a cozy outdoor patio for breakfast or inuman sesh and a walk-in closet/bath area. Click through the gallery at the end of this article to see pictures of the different rooms. If you want to make the most of your trip, try some of the less known, less conventional activities that await you in CamSur. Click on the next page to check 'em out. Villa del Rey is located at the Provincial Capitol Complex, Cadlan, Pili, Camarines Sur. E-mail: infocamsur@gmail.com or visit villa-delrey.com. If you're an outdoorsy chick (or would like to be one for a day), why not get your blood pumping on a mountain-trekking adventure? 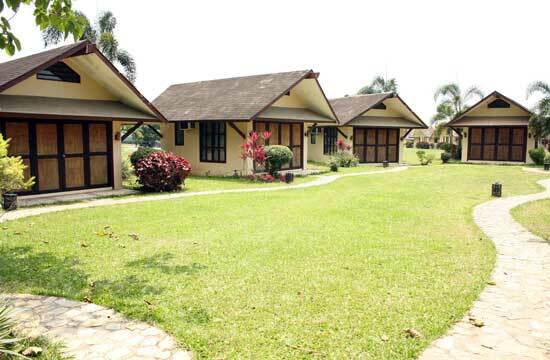 Consocep Mountain Resort is the perfect getaway from the hustle and bustle of your city life. Nestled on the shoulder of Mt. Isarog, imagine being surrounded by serene woods, soothing sounds of cascading water, and cool, refreshing mountain air… Sounds good, doesn't it? It's less than an hour's drive from CWC to the town of Tigaon, where the Consocep mountain resort is located. You'll get to explore on foot, so make sure to come in your comfiest sneakers and pack a light knapsack. As you hike to the peak, there are plenty of exciting side-trips along the way. You can climb up a century-old tree to the nifty treehouse in its branches, or take a romantic stroll through several man-made gardens. If you need to cool-off, take a dip in the pools beneath three majestic waterfalls found in the resort: Tumaguiti, Kawa-kawa, and Bulalakao Falls. Upon arriving at the top, marvel at the breathtaking view from1,800 feet above sea level. You might want to devote an entire day to go site-seeing, as Camarines Sur is undoubtedly a paradise worth exploring. Here are more not-so-known fun places and activities to try there. 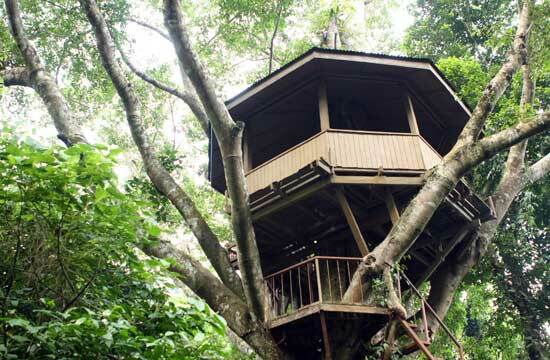 Tree-hugger gals should visit EcoVillage, an Eco Tourism retreat within the provincial capitol complex. You'll find natural and man-made wonders, from caves and waterfalls to fishponds and breeding houses. For the sports-minded, the wall climbing facilities are a must-try! If you're really into this extreme sport, also check out the bolted limestone wall found on Gota Beach in the Caramoan Peninsula, which is the first ever beach front rock climbing facility in the Philippines. For animal-lovers, dolphin watching at the new Ragay Gulf can be a fascinating experience. Spotted dolphins and Indo-Pacific bottlenose dolphins will greet passersby with their friendly and stunning exhibitions. (They are spotted most frequently from December to August.) Or, look to the skies, and go bird watching. There are many areas such as the Caramoan National Park and the marshlands of Magarao, Calabanga where you can spot exotic tropical birds, water fowls (like ducks and egrets), eagles, and hawks. Were you once a Bambi fan? Drop by the Deer Farm Ocampo, which is 20 to 30-minutes from CWC. 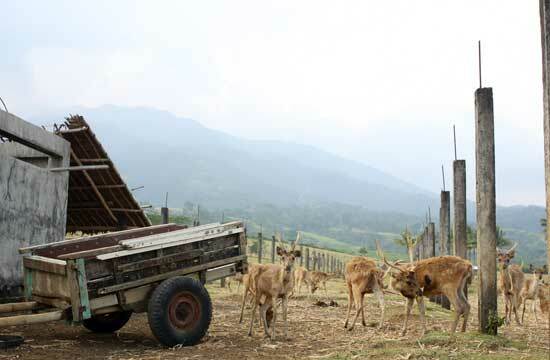 It has over 300 deer of different Australian and local species, and the CamSur government is out to breed more! Make a quick stop-over here for a nice photo-op, and if you're lucky, you just might get to feed the deer. They're too cute! If you're curious and in for something spooky and intriguing, visit CamSur's caves. At dusk, see countless bats emerge from Kulapnit Cave. Or, enter a whole new world as you step into the limestone Omang Cave. You can never get enough of ivory beaches and turquiose waters. Take a 20-minute motorboat ride from the Nato coastline to Atulayan Island. You and the girls can bask on the shore like divas, or watch a romantic sunset with your leading man. This tiny island is so pristine, you'd think you were on a movie set...which happens to be true! Atulayan was once the set of the French-Italian movie Mutiny in the South Seas. It's also famous for its gorgeous coral and seashells. For inquiries about Consocep Mountain Resort contact The Provincial Tourism and Culture Office at (+6354) 477-3172, or visit: www.camarinessur.gov.ph. Launch the gallery to view photos of CWC and its surrounding sights and accommodations.